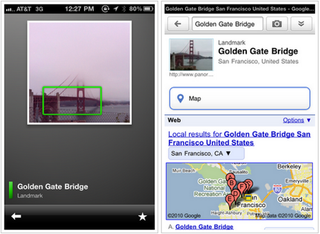 The wait for Google Goggles—the crazy good visual search app—to hit the iPhone was shorter than we thought. Today, it's finally been added as part of the Google Mobile App. Once you're in the Google app, just click the camera to activate Goggles. From there, you can identify and search for info on landmarks, logos, books, DVDs, etc. And as Google continues to tweak the function—it's still in Google Labs—you'll eventually be able to identify animals, foods, and whatever else Mountain View's mad scientists cook up. It's not clear yet if the iPhone version has have the same augmented reality powers of its Android cousin, but we'll know as soon as it rolls out.